Introduced in 2010 to replace the old DIN 65151, DIN 25201 demands a much tougher vibration test regime. A key stage to ensuring your fasteners comply with the standard is the reference test, which must be subsequently verified if a secured bolted joint is to gain DIN 25201 accreditation. Electronic displacement control is the only way you can accurately reference test your fasteners. 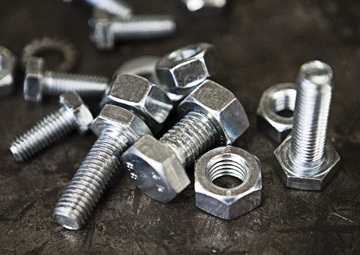 Industries downstream of the fastener sector, which includes the mighty automotive sector currently accounting for 25% of global fastener demand, have rapidly adopted DIN 25201. That’s because the new standard, designed to determine the point at which a secured bolted joint fails under vibration, is driving much higher safety and quality standards. And because Part B of the standard details exactly how the transverse vibration testing should be conducted with a Junker Test bench, it sets new standards for accuracy. This allows product researchers, manufacturers, distributors and downstream end-users to accurately compare the efficiency of lock-nuts, wedge washers or any securing element. Two of the many advances introduced by the DIN 25201 are the mandatory reference and verification tests that compare the self-loosening behaviour of bolted joints. The reference test will subject an unsecured bolted joint to transverse vibration using a Junker Test machine. The objective is to discover the effective displacement at which an unsecured bolted joint loses 100% of its preload after 300 load cycles, ±100 load cycles, at a fixed frequency of 12.5 Hz. The results of the reference test cycle are compared to a second set of tests, the verification test. This second test cycle vibration tests the bolted joint where a securing element has been installed. This comparison reveals the effectiveness of the securing element, and is of vital interest to product specifiers and design engineers. The previous DIN 65151 did not include a requirement for a reference or verification test. The requirements of DIN 25201 Part B are very demanding. First, you have to use a washer with highly specific shape, hardness and lubricant. Then you need to determine the displacement at which the bolted joint self-loosens; this is the reference test. The reference test then needs to be replicated in three further control tests using fresh bolts and washers and exactly the same settings. In practice, conducting the reference test means that the Junker Test machine operator must test for every possible displacement: starting from ±0.01 mm, then ±0.02mm, then ±0.03 mm and so on. The test requires gradually increasing the displacement until the unsecured bolted joint fully loses its preload after 300 load cycles, ±100 load cycles. On a manual Junker Test bench, without electronic control, this gradual increase in displacement must be done by hand. The operator must trusting his own eye to determine changes on a scale between 0mm and 2mm, which is a tough call for even the most experienced technician. The machine must be stopped, displacement increased, machine started, result monitored, machine stopped, displacement increased, result monitored… you get the picture! A Vibrationmaster Junker Test bench compliant with DIN 25201 and having electronically controlled displacement has an automated program that starts the displacement at 0mm and slowly increases it in small increments. The load cell continually measures the loss of preload and immediately the system detects that the loss is equal to loosening 100% after 300 load cycles, ±100 load cycles, the system stops and the reference test displacement has been identified. Having determined the displacement at which an unsecured joint loosens under vibration, DIN 25201 requires three subsequent control tests to confirm the original test results. The conditions of each control test must exactly match the reference test. It is only after all three control tests have replicated the original reference test that the operator can confirm the displacement to be used when conducting the verification tests. All Vibrationmaster DIN 25201 compliant Junker Test benches include as standard the electronic displacement control systems designed to reproduce the test results. If you are required to reproduce tests conducted previously, you simply plug all the variables into the laptop controlling the test machine and the test software will do the rest. Imagine how you would recreate the exact test conditions of a Junker Test completed six months earlier using a manual test machine and a different operator? And how could you convince product specifiers and design engineers that your fastener products have been tested according to the exacting requirements of DIN 25201? Contact us to find out how you can ensure your fasteners comply with DIN 25201.